The Pittsburgh Penguins won 46 games in as many chances when leading after two periods to start the season before the Tampa Bay Lightning won Game 5 4-3 in overtime, but despite a late Lightning push the Penguins were able to hold onto their lead to force a Game 7 with a 5-2 win. Sidney Crosby had his 3rd game winning goal of the series in as many Pittsburgh wins to go along with a 1st period assist, Nick Bonino had a goal and an assist, and Matt Murray stopped 29 of the 31 shots he faced after being benched in the previous game. Phil Kessel, Kris Letang, and Bryan Rust also scored for the Pens, and both teams will head back to the Consol Energy Center Thursday for a decisive final game to the series. The Penguins came out with a sense of urgency to start Game 6, doing a good job of keeping the puck in the Tampa zone and controlling play. Evgeni Malkin would make a great individual play to get a great scoring chance from right in front of the net that Andrei Vasilevskiy turned aside. The play would go the other way, where Victor Hedman would gain the zone and dish it off to Ondrej Palat. Matt Murray would come out of position to challenge the shot, and Palat's pass would bounce off a stick and sit in the slot for Jonathan Drouin, who buried the puck into the empty net. However, Mike Sullivan would challenge the play for offsides, and upon review it would be determined that Drouin's skate was off the ice before the puck crossed the blueline, and the score would remain 0-0. Having dodged a bullet, the Pens would return to driving the play, and they nearly got the official first goal after the puck took an unexpected bounce off the end boards to the front of the net, but Vasileskiy was ready and Eric Fehr wasn't able to beat the Lightning netminder. Eventually, the refs would wake up and call a penalty, and it would be Evgeni Malkin for a brutal slash on Ryan Callahan in retaliation for taking one from the Lightning forward seconds earlier. The Pittsburgh defense would do a good job of preventing Tampa Bay from getting much in the way of good chances, and they'd kill off the opportunity and receive their own moments later when Anton Stralman hit Tom Kuhnhackl with a big open ice hit as the pass sailed behind him. Pittsburgh would get a gift when Hedman cleared the puck over the boards behind the Penguin net from the Tampa defensive zone 41 seconds later to give them an extended 5-on-3 power play, and they'd take advantage when Phil Kessel deflected a cross ice pass inside the post to give the Pens the 1-0 lead. It was exactly the type of period Pittsburgh needed to start off the game - they controlled the play, they got the first goal, and they had a bit of luck on their side too. 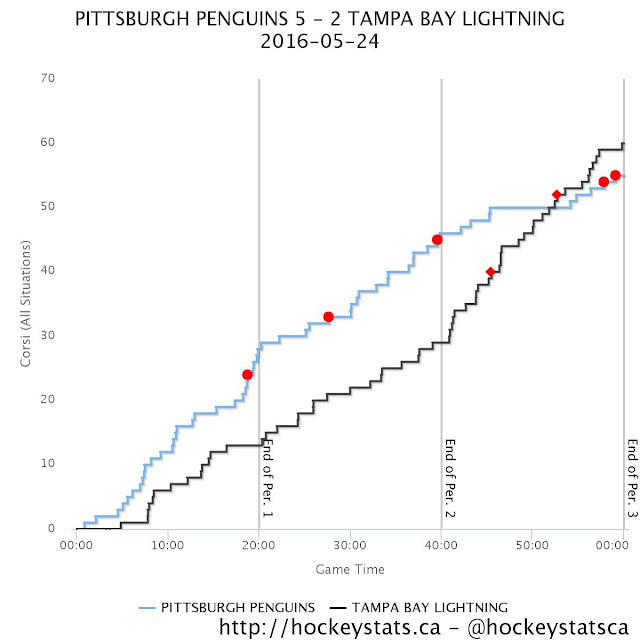 Tampa Bay would start off the 2nd period showing more offensive life than they did in the 1st, but despite a couple of good chances they wouldn't be able to get the puck past Murray, and it would be the Penguins who got the next goal on the board. Kris Letang took a pass off the rush and ripped a shot through a screen that beat Vasilevskiy cleanly on the far side. Midway through the period, Palat slashed the Nick Bonino's stick out of his hands along the boards in the Lightning zone, and the Penguins would go back on the power play looking to further extend the lead. They weren't able to cash in, and a Crosby broken stick led to the Lightning springing Palat on a breakaway exiting the box, but he wasn't able to beat Murray from the left circle. With the 2nd period winding down and the Pens looking to take a two goal lead into the locker room for the second intermission, Sidney Crosby grabbed the puck at the blue line, weaved through the Tampa defense, and slipped a shot five hole on Vasilevskiy to give Pittsburgh a big 3-0 lead with 25.6 seconds left in the period. They'd have a great opportunity to tack another one on the board seconds later on a 3-on-1, but Eric Fehr wasn't able to get a solid shot off and it went wide. Tampa Bay nearly was able to score in the first minute of the 3rd period when Murray wasn't able to handle a fluttering point shot, but he was able to get his right pad out to deny Palat on the rebound. Tampa Bay would continue to push, and they'd eventually get a goal when Phil Kessel batted down a Brian Boyle centering pass, and the puck took a strange spin and bounced off the ice and in, cutting the lead to 3-1. It was a fluke goal, but it would spark the Lightning attack on the ice and the fans in the stands, and the Bolts were able to sustain pressure in the Pittsburgh zone following the goal. They'd get another one with just over 7 minutes remaining in regulation when a loose puck bounced to Boyle at the right faceoff circle, and he picked the top left corner through traffic to cut the deficit to 3-2 Penguins. The Bolts continued to grow stronger and stronger as the period continued as they applied good pressure and the Penguins were focused more on dumping the puck out of the zone instead of trying to maintain control of it. 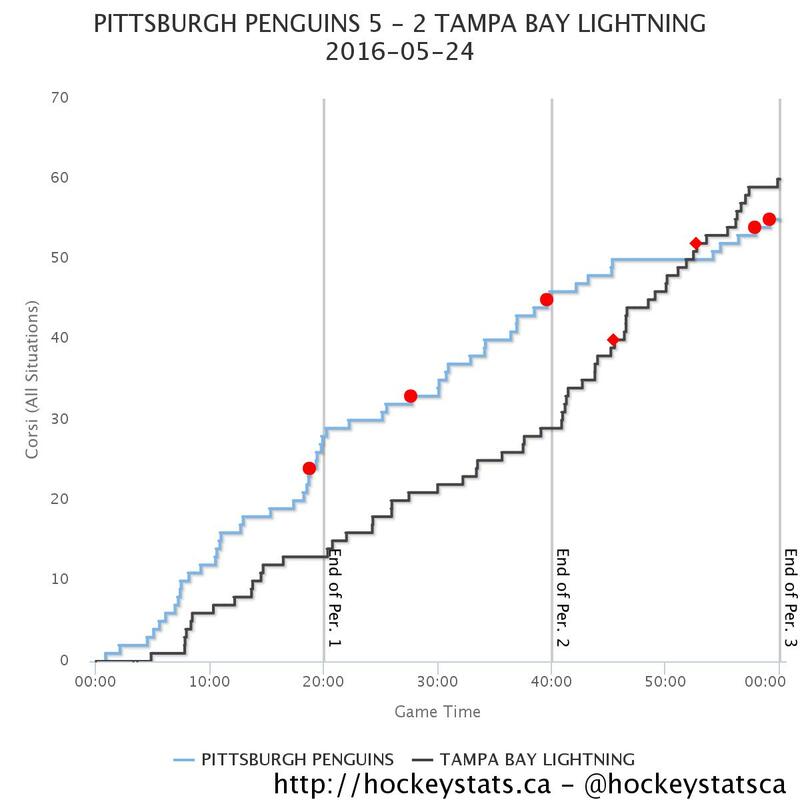 Like the Pens earlier in the game, Tampa Bay controlling the playing so thoroughly that it seemed to be only a matter of time before they got another. But with just over two minutes remaining, Chris Kunitz would spring Bryan Rust on a breakaway, and after a nifty deke he slipped the puck past Vasilevskiy for a huge goal that restored the two goal lead. Nick Bonino would chip in an empty netter over Slater Koekkoek from the blue line to give the Pens a 5-2 lead and ice the victory. The Pens dominated play through the first two periods, but it was a furious Lightning push in the 3rd period that nearly saw them tie the game. When all was said and done, they had built up a big enough of a lead to ride out that 3rd period, and Rust's breakaway goal prevented a 6-on-5 situation from having a legitimate chance to tie the game. The Eastern Conference Finals is now down to a de facto 1 game series, and whoever manages to come out on top Thursday will advance to the Stanley Cup Finals to face the winner of the Sharks/Blues series.